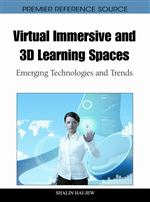 This chapter examines the importance of and possibilities for providing learner support and scaffolding in 3D virtual learning environments designed to promote and encourage learner exploration and discovery. The chapter begins with an overview of the need for scaffolding in discovery learning, before discussing scaffolding in technology-mediated learning environments. A framework is presented for understanding the types of scaffolding that can be provided in such environments. Using a case study based on the design of a 3D Virtual Chemistry Laboratory, examples illustrating the way each category of scaffolding within the framework could be provided within a 3D virtual environment are presented. The chapter concludes with coverage of the key considerations in designing scaffolded 3D virtual environments, as well as some of the important issues in adapting the concepts of scaffolding from face-to-face to technology-mediated environments. Proponents of immersive and three-dimensional (3D) virtual learning spaces have argued for designs based on a discovery learning paradigm, either explicitly (e.g. Chen, Toh, & Wan, 2003; Blanchard & Frasson, 2006; Bronack, Sanders, Cheney, Riedl, Tashner, & Matzen, 2008) or implicitly (e.g. Sanders & McKeown, 2007; Berge, 2008; Johnson & Levine, 2008; McKay, van Schie, & Headley, 2008). Discovery learning may be viewed as having its roots in the writings of authors such as Piaget (1973), who suggested that learners who are cognitively active will have learning advantages over learners who are cognitively passive, and Dewey (1938/1997), who stressed the need for learners to learn through concrete experience. It is Bruner (1961, 1962/1979), however, who is perhaps most widely regarded as the originator of discovery learning. Bruner claimed that discovery learning is an effective way of encouraging the learner to organize, assimilate, and integrate newly acquired knowledge in a cognitively active manner, as well as encouraging the learner to maintain a perspective on the purpose and significance of his/her learning, including developing an appreciation for the contexts and situations to which the knowledge may be applied. Mayer (2004), however, cites compelling research evidence gathered over three decades that attests to the inefficiencies inherent in ‘pure discovery learning,’ and advocates the use of guided discovery strategies incorporating cognitive activities aligned to the intended curricular outcomes, along with the provision of appropriate instructional support. In an education landscape where we are witnessing the advent of new and nascent ‘Web 2.0’ and ‘Web 3.0’ technologies that shift the locus of control and place the power of information and content creation and manipulation firmly in the hands of the “people formerly known as the audience” (Rosen, 2006, para. 1), a number of other authors have also highlighted the tensions that exist between autonomous, learner-directed approaches to technology-mediated learning and the need to design and provide suitable supports to guide and assist learners in line with self-regulated learning theory (Hai-Jew, 2008; McLoughlin & Lee, 2010). Wood, Bruner, and Ross’ (1976) concept of scaffolding is particularly important in this context, as is the related and arguably underpinning concept of the zone of proximal development (ZPD) (Vygotsky, 1978). These ideas not only direct our attention to the importance of learning supports, but also stress that the instructional process must incorporate a level of responsiveness to the individual needs and state of conceptual understanding achieved by learners (McLoughlin, 2002; Azevedo, Moos, Greene, Winters, & Cromley, 2008). A wealth of research has been conducted leading to the formulation of theoretically and empirically grounded design principles, guidelines, and models for scaffolding learning in traditional or face-to-face settings (see, for example, Palincsar, 1986; Bliss, Askew, & Macrae, 1996; Hogan & Pressley, 1997; Sanders & Welk, 2005); more recently, a growing body of literature has emerged concerning the use of scaffolding in technology-mediated learning environments (McLoughlin, 1999; Winnips, 2001; McLoughlin, 2002; Brush & Saye, 2001; Davis & Miyake, 2004; Sharma & Hannafin, 2007; Jacobson & Azevedo, 2008). A key question, then, is how to apply these ideas from conventional instructional design to the design of 3D virtual learning environments (VLEs), including the new wave of 3D virtual worlds and multi-player online games whose purported educational uses and benefits are garnering much attention and excitement in all sectors of the education and training industry.